Perfect, quiet villa with private pool, beautifully landscaped gardens & terrace, fully equipped for self catering family holidays including internet, satellite TV & gym. Two km to nearest amenities. 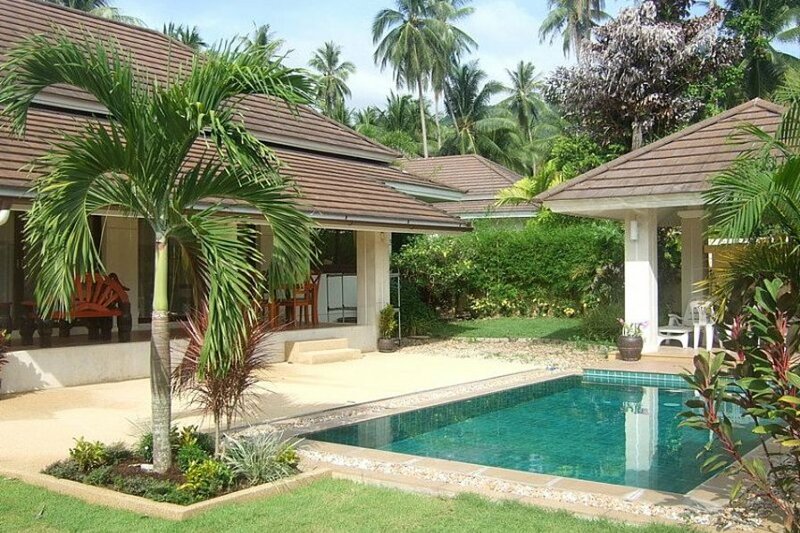 “Baan Tan Ta Wan” offers exceptional value for money as a self catering holiday villa. The villa is completely set up for family self catering holidays providing guests with a spacious and very enjoyable environment with the added luxury of a hotel style house keeping service every 4 days. The on site management team ensure that our residents are very well looked after and they will assist with any car rental or other requirements that you may have. They are also very happy to provide advice about local attractions or any other questions you may have about life in Koh Samui. The villa has a beautiful landscaped garden and private pool which is maintained to provide crystal clear water. The garden receives sunshine all day and is a lovely place to relax or sunbathe. Various sun loungers, and exterior furniture are provided to give a great choice of dining or sitting options. There is a spacious living room with satellite flat screen LED TV, DVD and wi-fi internet and a fully stocked modern fitted kitchen are . The villa is set within an enclosed garden with private overflow swimming pool & dining sala. This private family home offers quiet living within a very peaceful well managed, development. Samran Gardens is comprised of 30 uniquely styled villas surrounded by landscaped gardens and includes a fully equipped gym which is available free of charge to all residents over the age of 16. The villa will comfortably accommodate 6 adults and all rooms are tastefully decorated and furnished with locally made furniture, carvings and pictures, providing a very light and pleasant living space. Glass doors the full length of the room make this a very pleasant space with plenty of natural light while the veranda extending down from the roof and the two large ceiling fans keep the room cool during the day. This room overlooks the terrace, pool and garden which can all be illuminated at night. Large double rooms with with remote controlled air-conditioning. Beech laminate flooring, natural coloured décor and venetian blinds. Each room is furnished with Double bed, Wardrobe, Bedside tables & lamps. The house is stocked with all necessary bed linen, duvets and pillows. Master Bedroom also has Dressing table, LCD TV & DVD and en-suite bathroom. Open plan kitchen with fitted storage units and equipped with large fridge/freezer, Electric Oven, Gas Hob, Extractor hood & Microwave. The kitchen is also stocked with all necessary items such as, Kettle, Toaster, Rice cooker and a full range of crockery, cutlery, glasses, pans and kitchen utensils. Has automatic washing machine and clothes rack and is ideal for storing suitcases and other large items such as diving gear. ~ A Childs sleeping cot and push buggy are available subject to availability. ~ Welcome pack – tea, coffee, water and creamer. ~ Airport collection service and return on day of departure and car rental can be arranged directly with villa rental manager if required. Private swimming pool and sala house. Fully equipped gym available on Samran Gardens free of charge for residents. Large patio area next to pool perfect for relaxing on sun loungers.